Catching Bluegill on the fly rod isn’t necessarily noteworthy. 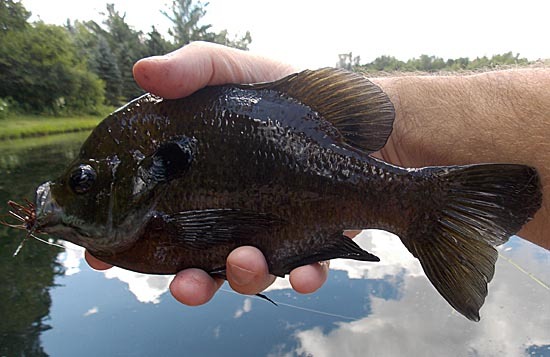 Every Bluegill caught being over 9 inches, however, is definitely something worth writing about. As I fished in private waters today, I was reminded that the most important factor in fishing is simply having quality fish available at the location you are at. Sometimes we over emphasize the smallest of details, technique and gear, when in actuality the most important thing to do is find a place with quality fish that are hungry. I remember watching the weigh-in at a PWT (Professional Walleye Trail) years ago where the winning angler was getting asked all kinds of questions regarding lures, depth, speed, what kind of bottom structure – all kinds of specific detailed things. The angler looked at the emcee and simply said, “I found a school of hungry fish, and they were big”. I thought to myself, this angler won’t have a single sponsor left as to not take advantage of a line of questions that was perfectly set up to ‘name drop’ sponsors for every aspect of how he won the tournament. As I later reflected on the comments, I simply appreciated the honesty and thought there was an abundance of truth in what he said. So today, I wasn’t an amazing or accomplished angler for catching a dozen “Fish Ohio Award” sized Bluegill on the fly – I simply chose an amazing place to fish.